First things first – the winner of the Brain Teaser from the last edition was John McClumpha (who didn’t want the prize, but congratulations anyway John!) The next person in line who got it right was Les Bird – congratulations to you too Les – but Les didn’t want the prize either as he already had what was on offer! So we’ll save it for at least one more edition of the Babbler after this one. We’ve made it a little harder this time. See page six for the current Brain Teaser and keep those entries coming in. The answer this time was ~~~~~ the match is always lit first! From Kylie Singleton LfW Officer at DEPI Traralgon who let us know about the following – Mange is a cruel disease where, without treatment, the afflicted animal will always die a slow and painful death - and apparently wombats can transfer this disease to your cattle, so a good idea to treat the wombats before they infect your stock! New & Used Stamps - Fundraising Project for Mange Management We are collecting all sorts of used and new stamps to sell them so we can raise funds for Mange Management. You can help us out by donating stamps. Please send them to - Mange Management, c/o Ian Maberly, P.O. Box 296, Warburton VIC 3799. 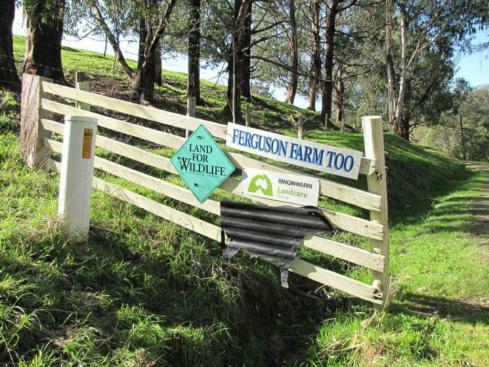 If you have ever wondered who Norman Wettenhall was (the man the philanthropic foundation is named after) and whose foundation has financially and intellectually supported the JARR Project over the past few years, read this link (over the page) - http://www.landcarevic.net.au/resources/magazine/vic/current-issue/vlcm-issue59-pages7-12/view - which features in the latest Vict. 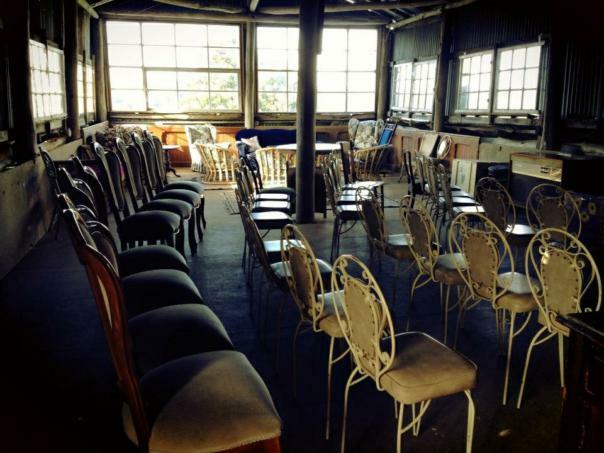 Landcare Magazine on p.10 - along with a photo of our very own JARR Chair as a lovely bonus! Release of Draft Victorian Coastal Strategy 2013 for consultation The Victorian Coastal Council is preparing the next iteration of the Victorian Coastal Strategy (VCS). The VCS is a whole-of-government policy and long-term framework for planning and managing the coastal and marine environment of Victoria. The first stage in preparing the next VCS is releasing a draft for public consultation. The draft Strategy outlines the proposed approach for how we plan and manage our coast and marine environment. The release of the draft is an opportunity for all Victorians to have a say on how our coast is managed. The Council would like to know if the draft Strategy reflects your aspirations for the Victorian coast and provides effective guidance for decision making. Council would like to hear from people who live, holiday and visit the coast, including the community of volunteers involved in caring for the coast and people who work on the coast. Your experience, ideas and input are an important part of developing the final Strategy. There were info sessions held during October but as they are now over I have deleted them from this article. I’m sorry that our publication date did not allow their inclusion. Fred was in the fertilised egg business. He had several hundred young pullets and ten roosters to fertilise the eggs. He kept records and any rooster not performing went into the soup pot and was replaced. This took a lot of time so he bought some tiny bells and attached them to his roosters. Each bell had a different tone so he could tell from a distance which rooster was performing. Now he could sit on the porch and fill out an efficiency report by just listening for the bells. Fred’s favourite rooster, Old Butch, was a very fine specimen but this morning he noticed that old Butch’s bell hadn’t rung at all! When he went to investigate, he saw the other roosters were busy chasing pullets, bells-a-ringing, but the pullets hearing the roosters coming, would run for cover. To Fred’s amazement Old Butch had his bell in his beak so it couldn’t ring. He’d sneak up on a pullet, do his job and walk on to the next one. Fred was so proud of Old Butch that he entered him in the Yarram Show and he became an overnight sensation among the judges. The result was that they not only awarded Old Butch the ‘‘No Bell Peace Prize’’ but they also awarded him the ‘‘Pulletsurpise’’ as well. Clearly, Old Butch was a politician in the making. Who else but a politician could figure out how to win two of the most coveted awards on our planet by being the best at sneaking up on the unsuspecting populace and screwing them when they weren’t paying attention? Vote very carefully in the next election; the bells aren’t always audible!! The Yarram-Alberton West Rail-trail treeplanting went very well with about seven hundred plants put in by the seven people in attendance on the Sunday, which turned out to be sweaty work as it was a warm day. We had three hundred plants left and decided to go back the next day to finish the planting so five of us turned up in the cold and wet and finished it. (It may have been wet the first day and hot the next, can’t remember which way it went!) Thanks Kev for the site prep. The day was topped off by a mud-bash in 4WD’s getting from one particular paddock to the next….good driving folks! The But But Flora Reserve was a very pretty little parcel of land 15kms north of Yarram on the Sale Rd., that just three people discovered together, having braved an atrocious-sounding weather forecast which didn’t turn out too badly (we only got showered on twice!) The walking was easy and we didn’t need to cover a large area. The terrain covered two distinctly different habitat types that increased the wildflowers we saw – Yellow Stars, purple Common Fringe Lilies that really aren’t so common, white Kunzea, blue Love Creepers, creamy-gold of small St John’s Wort, yellow everlastings from the Leptorhynchos family, red Running Postman, yellow Guinea Flower, white Riceflowers, bluebells, yellow donkey orchids, cream grass tree flowers and yellow black wattles were just some of the colourful plants we found in flower. Does anyone have recipes to share? Send your favourites in now to the Editor. Blitz the biscuits in a food processor until beginning to turn to crumbs, then add the butter and whiz again to make the mixture clump. Press the mixture into a 20cm springform tin: press a little up the sides to form a slight ridge. Beat together the cream cheese, icing sugar, vanilla extract and lemon juice in a bowl until smooth. Lightly whip the double cream then fold it into the cream cheese mixture. Spoon the cheesecake filling on top of the biscuit base and smooth with a spatula. Put it in the fridge for 3 hours or overnight. When you are ready to serve the cheesecake, un-mould it and spread the black cherry over the top. Place biscuits and cocoa into food processor and blend until fine. Add coconut, condensed milk and vanilla, and mix well. If the mixture is runny, place bowl in refrigerator for 30 minutes until it firms and if still runny add more coconut. Gently roll generously heaped teaspoons of mixture into balls and then gently roll in the extra coconut till coated well. Place on tray and refrigerate till well set. Store in sealed container in fridge. The frog said to the princess, "I was once a handsome prince until an evil witch put a spell on me. One kiss from you and I will turn back into a prince and then we can marry, move into the castle with my mum and you can prepare my meals, clean my clothes, bear my children and forever feel happy doing so." This editions brain teaser from John McClumpha. First correct answer (send to, or ring Kaye Proudley) wins the prize! Peter, the office boy was asked by 5 girls in the office to call in and buy them some tickets to the concert on the weekend when he goes out to buy the lunches. The tickets were $20 each. So each girl gave Peter $20. When Peter got to the ticket office he found out he could he could get the tickets for $15 each for a group booking. Peter considered himself somewhat of an entrepreneur so he pocketed some of the savings. He took $2 dollars for each ticket and gave the remaining $3 saving per ticket to each girl. In summary Peter was given $100. The tickets cost each girl $17.00, a total of $85. Peter pocketed $10. This gives a total of $95. But what happened to the other $5? Fancy yourself as a hotshot with that camera of yours? Don’t be shy; show us what you’ve got! We’re on the hunt for more great photos for our display set and would love to see what you can produce – as long as you will allow us to use your images. Full credit given with all photos used. We’d like to thank our contributors for their ‘you-beaut’ work: Kim Baggaley, John McClumpha, Alison Kuiter, Mark Wouters and me! Animals, birds, insects, flowers, fish or fungi – we don’t mind if they were taken outside of the area - as long as they also occur here in the Binginwarri area. Please ring or email Kaye or John to discuss how we can see your work. Contact details on the first page. Picture a gorgeous woodland in the early 1800s. What do you see? Majestic gum trees with bent old boughs, golden grasses, a mob of sheep or kangaroos, and a forested hill in the distance? The luminous landscape of a Hans Heysen painting, perhaps. It’s an iconic Aussie landscape. But something’s missing. The trees are wrong. Or at least, they aren’t all there. Two hundred years ago, another group of trees – Honeysuckle, Oak, Lightwood and Cherry – formed extensive woodlands across many parts of south-east Australia. Today we call these trees Silver Banksia (Banksia marginata), Drooping Sheoak (Allocasuarina verticillata), Wild Cherry (Exocarpos cupressiformis), and Lightwood (Acacia implexa) or Blackwood (A.melanoxylon). … nearly all the trees were shiacks [she oaks], — not the eternal gum-trees, — and these, interspersed with Banksias, now in fresh foliage, and new pale yellow cones, or rather bottle-brushes, with a sprinkling of gums and golden wattles, gave what you rarely see in that country, a variety of foliage and hue (Howitt 1858, p. 206). As an indigenous plant propagator for the past 25 years or more, it was an idea that occurred to me way back that we were not putting enough variety into our plantings, as well as always using eucalypts as the base of every planting, everywhere. Ian explains this, with historical backing, very clearly, much better than I could ever do but I fully agree with what he says. And I would go further than his article suggests (and as he may have done in other blogs on his site) in just growing a bigger variety of trees – the ground flora is what is missing in so many current plantings; lilies, small daisies, orchids, tiny and small bushes, clumping plants, groundcovers, grasses and creepers & climbers. The list goes on. One of the reasons that our bird and animal life is declining is there is not enough understorey planted to give homes, food and protection from predators to the small fauna. It is one of the reasons that the bossy Australian Noisy Miner takes over areas to the exclusion of other small birds that eventually either move on or die. We only have to read historical records of the early naturalists and explorers to know what was here and plant it back like we were living two hundred years ago! Read this interesting article on Tadpole Shrimp by Kaye Proudley. Very wise words from Dr. Seuss - probably not as originally intended though! 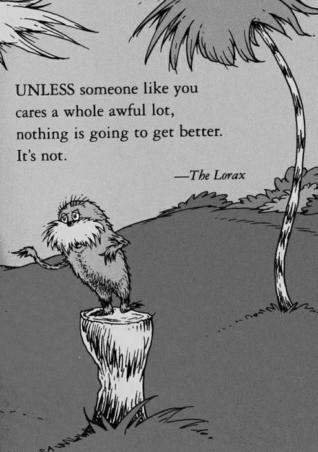 I can’t top the Lorax for wise words, apart from adding that he may well be talking about YOU ‘stepping up to the plate’ to become a committee member and helping a little with the work load to run this group. If it escaped your attention, we are now down to just two working committee people. Come to a meeting and see if this is for you. We’d love a bit of a hand! So for this edition, that’s it from me and that’s it from him!